October 5, 2005  New music from Paul McCartney; A revival for folk artist Vashti Bunyan; New Brit pop from Supergrass; The howl of Black Rebel Motorcycle Club; A lovely night with singer Richard Swift and more. 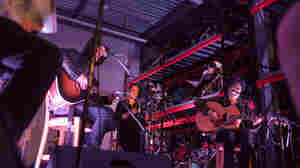 July 4, 2013  Hear the band perform a stripped-down session, recorded at the Harley-Davidson Museum in Milwaukee. September 10, 2007  On Howl, Black Rebel Motorcycle Club's members re-imagine themselves as a blues and country band and strip away the guitar noise heard on past records. Hear a performance from the secret Bumbershoot Festival stage, recorded by KEXP with commentary by Cheryl Waters. August 9, 2007  Upon first listen, the swaggering rock of the band's new Baby 81 stands in stark contrast to the rootsy folk-rock of the record that preceded it. Still, closer examination reveals that the driving riffs often mask an acoustic core. 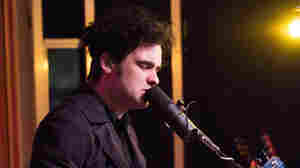 Hear an interview and in-studio performance. 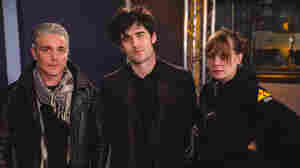 January 12, 2006  Black Rebel Motorcycle Club's new album, Howl, unveils a new blues, country and gospel-inspired sound. The mostly acoustic songs on the record, tinged with Americana, are an intriguing departure from the California band's trademark dirty rock sound. March 17, 2010  "Beat the Devil's Tattoo" finds a subtle, down-tempo side of BRMC's style. Taking a cue from The Velvet Underground, the song opens with the bare twang and drone of an acoustic guitar and the steady jangle of a tambourine. The crunch of electric guitar arrives almost as an afterthought, giving weight to singer-guitarist Peter Hayes' sneering remark that "everyone is king when there's no one left to pawn."